Minton from 1796 and during its nearly two hundred year history, has been a very important Stoke firm that has traded under various styles. After Herbert Mintons death in 1858 the Minton name continued as the Company name but no Minton family member has been connected with the firm since. 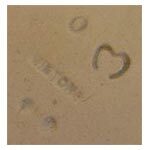 Over the company’s 200 year history the names associated with the Minton marks on porcelain and china changed. So, let’s begin by detailing what those name changes were. Rare pseudo Dresden crossed swords mark in underglaze blue on floral encrusted porcelain, which is sometimes confused with Coalport porcelain. Several variations of Minton Marks incorporate the initial M.
Painted Mark ‘Ermine’ indicating a special soft glaze. Earliest recorded use May 1850 on the Godden Collection. 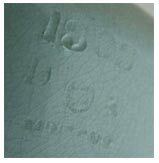 Example Minton impressed marks showing full set of three marks – month letter O for October, illegible potters mark and year cypher for 1875. Found on piece signed 1876. MINTONS Standard print mark with crown added. England added from 1891. Made in England appears from c1902. Modern Minton mark intoduced in 1951. This example showing various pattern details and including the designers signature. From c1842 Minton introduced a year cypher.